Who are the Kouachi brothers, suspects in Paris shooting? The gunman in the supermarket attack, identified as Amedy Coulibaly, 32, was named as a suspect in the Thursday morning killing of a French policewoman. He took 19 hostages in the grocery, according to an Israeli official recounting a conversation between Israeli Prime Minister Benjamin Netanyahu and Hollande. Paris prosecutor François Molins said Friday evening that Coulibaly killed four hostages immediately upon entering the market. Earlier reports from the scene suggested the hostages were killed after police mounted their raid. One police official said Coulibaly opened fire with an automatic weapon in the kosher market after entering and declared, "You know who I am." ​During the early hours of the standoff, Coulibaly threatened to kill the remaining hostages if French authorities launched an assault on the two brothers, a police official said. 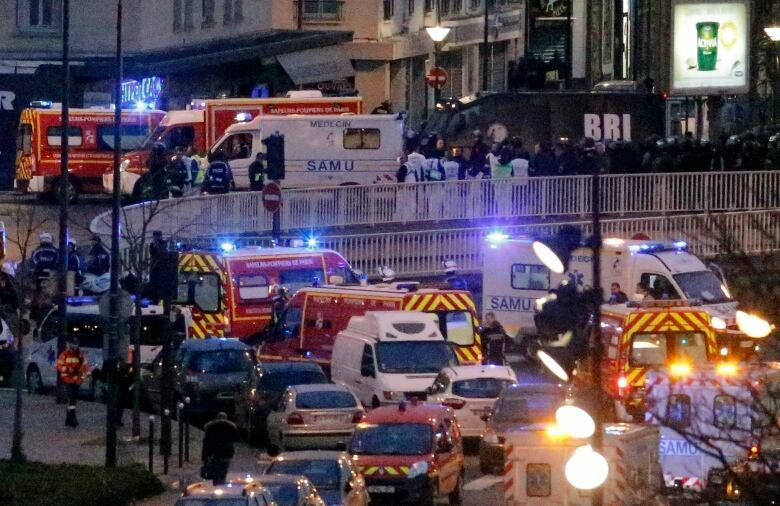 Some hostages were seen rushing from the market after heavily armed police broke the siege, rescuing 15 people. Police have uncovered several connections between Coulibaly and the younger of the Kouachi brothers, Cherif, dating back to about 2010, when Coulibaly was sentenced to five years in prison for an abortive attempt to free a man convicted on terrorism-related charges from prison. Smain Ait Ali Belkacem was serving a life sentence for a bombing attack on the Paris rapid transit system in 1995. Cherif Kouachi was detained in that investigation, but freed later without being tried. French judicial documents obtained by The Associated Press said Coulibaly and the younger Kouachi travelled with their wives in 2010 to central France to visit Djamel Beghal, who had been sentenced to 10 years in prison on a terrorism-related charge. According to the judicial documents, a police search of Coulibaly's residence in 2010 turned up a crossbow, 240 rounds of 7.62 mm ammunition, films and photos of him during a trip to Malaysia, and letters seeking false official documents. In a police interview that same year, Coulibaly identified Cherif Kouachi as a friend he had met in prison and said they saw each other frequently, according to a transcript of the interview obtained by the Journal du Dimanche newspaper and posted on the newspaper's website. 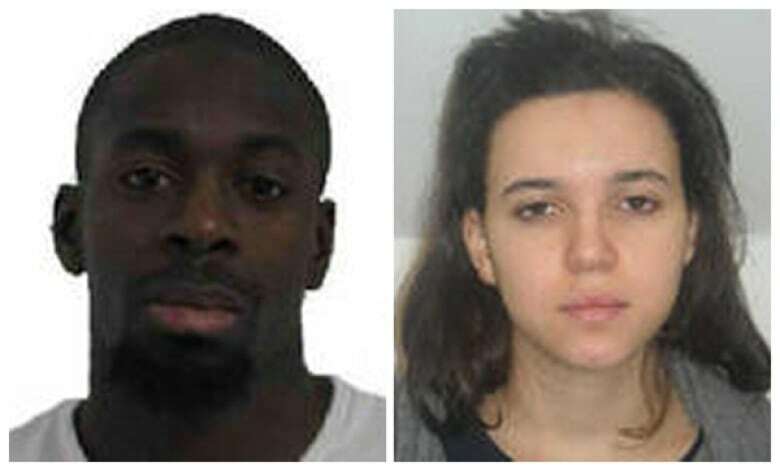 Molins, the Paris prosecutor, said authorities increasingly grew to see links between the attackers after they discovered that Boumeddiene and the companion of one of the Kouachi brothers had exchanged about 500 phone calls. 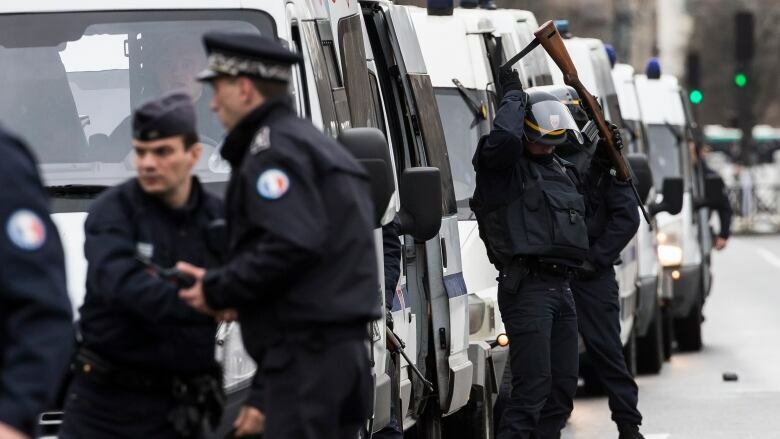 French television station BFM said it spoke with CherifKouachi and Coulibaly on the phone in separate conversations shortly before they were killed by police. Coulibaly said the three men were co-ordinating their actions and that he was affiliated with ISIS. The Kouachi brothers claimed allegiances to al-Qaeda in Yemen, however, which is a group at odds with ISIS. Police also named Hayat Boumeddiene, 26, as a suspect in Thursday's slaying. She is Coulibaly's wife, and early ​reports suggested she may have accompanied Coulibaly during the supermarket hostage-taking. Her fate remained unclear, but one police source told Reuters she may not have been inside the market during the standoff. Fifteen hostages were rescued by security forces after they stormed a kosher grocery store on the eastern edge of Paris. (Francois Mori/Associated Press)​She is still wanted by police, who issued a bulletin Friday night asking anyone with information about Boumeddiene to contact them. In an afternoon national address, Hollande called for national unity and said the country should remain "implacable" in the face of racism and anti-Semitism. "It is indeed an appalling anti-Semitic act that was committed," he said of the hostage-taking in eastern Paris. "France has not seen the end of the threats it faces."